35 mm 3 piece 2 PLY P.V.C. 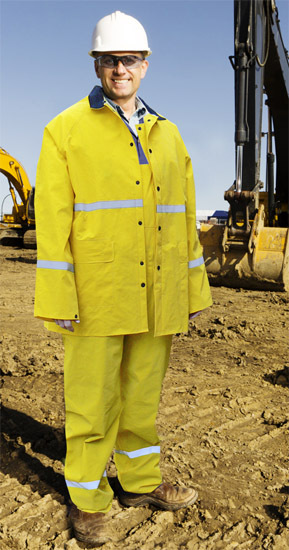 heavy duty rainsuit with super strong polyester lining. Features electronically welded seams, take up snaps on sleeves and ankles, and a soft lining for extra comfort. It also has a detachable roomy drawstrings hood and a ventilated cape back for extra comfort, two flapped pockets. It is soft and pliable even in low temperature, has a high visibility color and is 100% waterproof. 35 mm 2 piece non-conductive P.V.C. knee length raincoat with super strong polyester lining features electronically welded seams, take up snaps on sleeves and a storm-fly front which is non-conductive. It also has a detachable roomy drawstrings hood, two flapped pockets and a ventilated cape back and soft lining for extra comfort. It is soft and pliable even in low temperature, has a high visibility safety color and is 100% waterproof. 3 piece non-conductive 3 ply super heavy duty P.V.C. rainsuit with super strong nylon lining in between, features electronically welded seams, take-up snaps on sleeves and ankles and a nylon lining for extra durability. It also has a storm-fly front with non-conductive, non-corroding duracon snaps, a detachable roomy drawstrings hood, two flapped pockets and a ventilated cape back for extra comfort. Its bib style trousers with snap-fly has elastic suspenders with non-conductive, non-corroding buckles. It is soft and pliable even in low temperature, has a high visibility safety color and is 100% waterproof. Sizes: Small-5XL. 20mm 2 piece 1ply, P.V.C. rainsuit features electronically welded seams, take up snaps on sleeves and ankles an lamination that never detaches. It also has a storm-fly front with non-conductive, non-corroding, duracon snaps, a roomy draw strings hood, two flapped pockets and a ventilated cape back for extra comfort. Its bib style trousers with snap-fly has elastic suspenders with non-conductive, non-corroding buckles. It is soft and pliable even in low temperature, has a high visibility safety color and is 100% waterproof. with fly and take-up snaps at waist and ankles, absorbs perspiration in hot weather and provides warm lining in cold weather. Poncho 0.10mm hooded PE poncho, size 50”X80”, one size fits all, fits in glove box purse or pack. Used for sporting, hunting and fishing. 2 piece 35 mm non-conductive P.V.C. rainsuit with super strong polyester lining features electronically welded seams, storm-fly front with non-conductive, non-corroding duracon snaps, and a soft lining for extra comfort. It also has an attached roomy drawstrings hood, two flapped pockets and take up snaps on the sleeves and ankles. Its bib style trousers with snap fly has elastic suspenders with non-conductive, non-corroding buckles. It is soft and pliable even in low temperature, has a high visibility safety color and is 100% waterproof. storm-fly front with non- conductive, non-corroding duracon snaps, and a soft lining for extra comfort. It also has a detachable roomy drawstrings hood, two flapped pockets, a ventilated cape back for extra comfort and take-up snaps on sleeves. It is soft and pliable even in low temperature, has a high visibility safety color and is 100% waterproof. 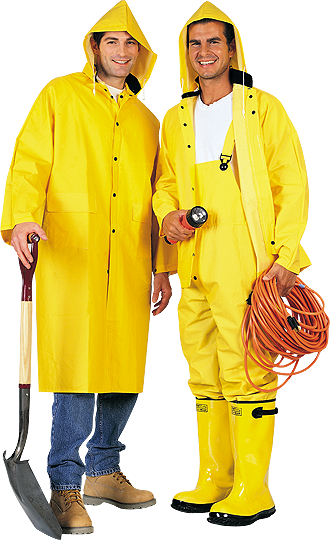 This 10 mm 2 piece rainsuit which is light weight yet durable, features electronically welded seams, a P. V.C. stub front closure, take-up snaps on sleeves and ankles, and two flapped pockets. It also has an attached roomy drawstrings hood, a ventilated cape back for extra comfort, and elastic waistband trousers. It is soft and pliable even in low temperature, has a high visibility safety color, and is 100% waterproof.